1. You will need to download the INOGENI Control App first. 2. Please open the INOGENI Control App and plug your device. 3. Find the Unique identifier section in the application. See below where your can find it. 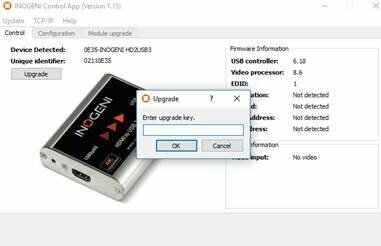 You must send an upgrade request to upgrade@inogeni.com with your unique identifier in order to have the upgrade key necessary to unlock 4K functionality. The upgrade fee is $95USD. Upon payment, the upgrade key will be sent to you. 4. 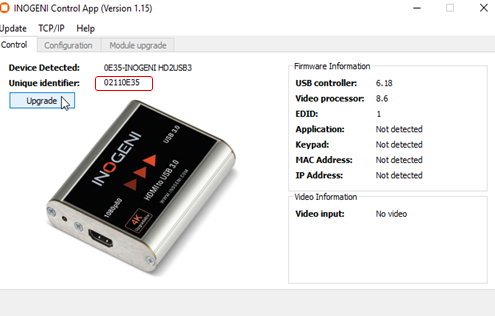 When you have received your upgrade key, you can click on the Upgrade button. You can click Yes on the message prompt. 5. Enter the upgrade key in the message prompt. 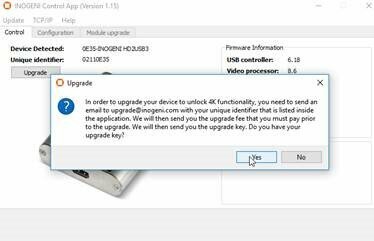 If the upgrade key is recognized, the 4K functionality will be unlocked. 6. Congratulations! Your device is upgraded.